eruption plume as it breaks through to the surface (January 2014). According to researchers from NASA's Jet Propulsion Laboratory (JPL), man-made global warming has been “hiding” in a deep and limited portion of the Pacific Ocean since the year 2000, thereby explaining why worldwide atmospheric temperatures have not risen during the 2000-2015 time frame. Wasn’t it just this last June that NASA’s Gavin Schmidt from the Goddard Institute for Space Studies in coordination with the National Oceanic and Atmospheric Administration (NOAA) announced that after “adjusting” historicalworldwide temperature data there has not been a global warming pause? So which NASA group are we to believe? Has there been a warming pause or not? Has the heat energy from man-made CO2 warmed air been somehow transported into a limited portion of the deep Pacific Ocean or not? Conflicting statements by the two different NASA entities brings into focus several political and scientific questions. This article will address one of the scientific questions, specifically the root cause of western Pacific Ocean warming during the 2000-2015 time period. Discussions of the other questions arising from this NASA infighting such as the nature / validity of the global warming pause, NASA’s ever diminishing scientific credibility, and NASA’s apparent inability to communicate internally will be covered later. NASA’s man-made global warming deep ocean “hiding” place lies directly above one of the most active sub-ocean geological heat flow regions on earth, the Solomon Island / New Guinea portion of the western Pacific. A visually dramatic example of this geological heat flow is shown in the photo atop this article (Figure 1). It shows the ocean surface expression of the heat plume from a sub-ocean volcano named Kavachi which is located in the Solomon Island Chain. Even more telling are recently updated deep ocean maps which have identified many hundreds of deep sub-ocean volcanoes, hydrothermal vents and fault zones in this limited geographical area. None of these geological features are monitored for heat flow. However this Solomon Island / New Guinea portion of the western Pacific Ocean has recently been temperature mapped utilizing cable pulled deep diving temperature probes. This research project found that this area is extremely warm portion of the Pacific Ocean. This area has been very geologically active in the late 1990’s and early 2000. 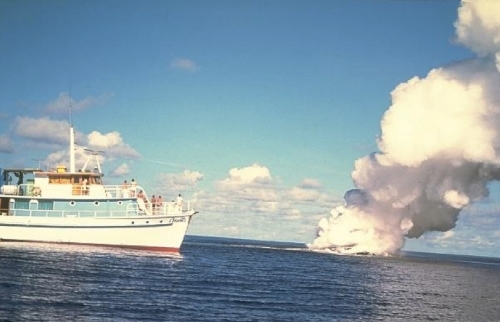 There have been numerous sub-ocean volcanic eruptions, nearby land based volcanic eruptions, and major deep ocean fault movements during this time period. This timing matches well with increase in mid ocean depth (100-300 meters) western Pacific Ocean seawater temperature increases as mapped by NASA in the 2000-2015 time period. All historical El Ninos including the currently emerging 2015 El Nino (Figure 2) have originated at this same deep western pacific Ocean Point source in the Solomon Island / New Guinea area. The Solomon Island / New Guinea heating source point is fixed / non-moving. Fixed heating source points are associated with fixed geological features such as volcanoes, and not with ever moving atmospheric heat sources. If atmospheric global warming caused the warmed Pacific Ocean seawater as NASA contends, it would not occur in the exact same location for 15 years. Atmospheric and ocean currents are too variable and strong to have deposited this massive heat pulse in the exact same location for 15 years. Other Deep Ocean Geological Heat Sources have been substantiated. Deep ocean geologically induced heating is proven to have occurred beneath the Arctic and Antarctic Ocean Ice Caps. NASA and NOAA scientists are what might be termed “atmospherically biased”. They force fit all data into an atmospheric context. It’s what they know and what they were taught. Deep ocean geological forces are not well understood and almost completely unmonitored. Lack of geological data and an abundance of atmospheric data lend itself to narrow focused solution thinking. The NASA and NOAA scientists are very bright and dedicated folks, just biased. See also: Update On Geothermal Heat And Arctic Ocean Sea Ice Melt, West Antarctic Ice Sheet Melting From Geothermal Heat, Not Global Warming, Antarctic Volcano Mount Erebus Wakes Up. of New Guinea and is marked as the “Heat Point Source” on the map. In summary, think of what you are being asked to believe by the JPL NASA folks. All of Earth’s man-made global warming heat energy for 15 years has been somehow concentrated, transported laterally across the globe to one limited geographic area of the western Pacific Ocean. Lastly this massive heat energy source has been transported vertically downward in the ocean column bypassing shallow cooler water layers coming to rest at a 100-300 meter seawater depth. This is a highly unlikely and overly contorted explanation. A much more straightforward and logical explanation is one that fits Plate Climatology Theory. The NASA observed western Pacific Ocean warming is due to increased heat flow from deep ocean volcanoes, hydrothermal vents, and heat emitting fault zones…not man-made atmospheric global warming.